Original, provocative and exceptionally prolific, British comedian Dane Baptiste returns with a show about our worldwide pursuit of wealth, power and pleasure. He will bring his new show G.O.D. to The Black Sheep, Brussels, on Tuesday February 6th. 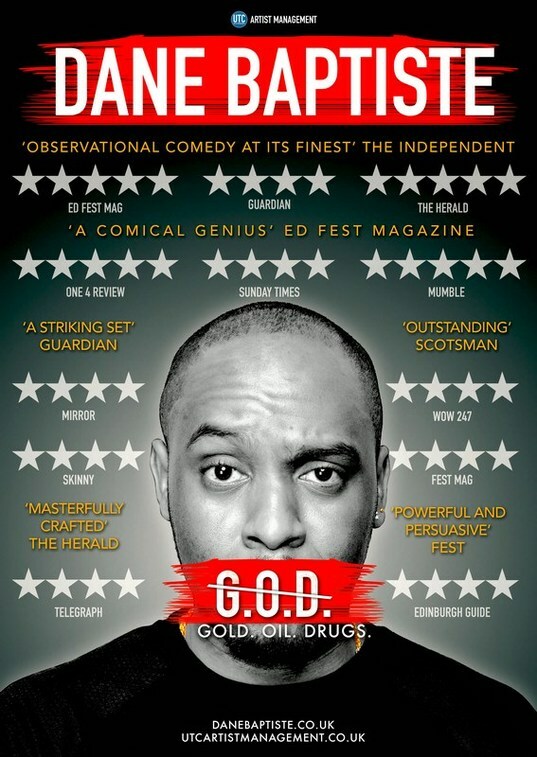 Baptiste made comedy history in 2014 as the first Black British act to be nominated for an Edinburgh Comedy Award. And now he’s back with a new show after the incredible success of his debut show Citizen Dane – which nominated him for Best Newcomer at both the Foster’s Comedy Awards at 2014’s Edinburgh Fringe Festival and again in 2015’s Chortle Awards. You may have seen in Live at the Apollo, Tonight at the London Palladium, Mock the Week and 8 out of 10 Cats. He has also written and starred in his own sitcom Sunny D for the BBC.